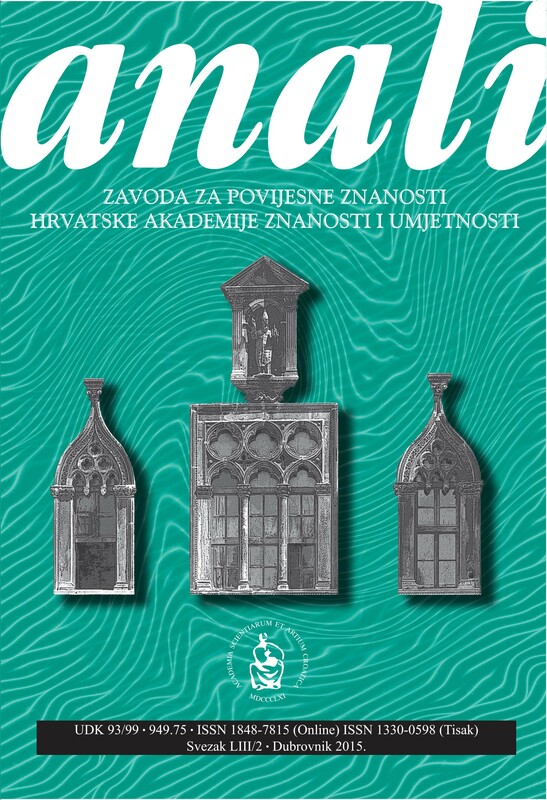 Annals of the Institute for historical sciences of CASA in Dubrovnik is an annual in Croatian language dedicated to the history of Dubrovnik and the surrounding areas (Dalmatia, Bosnia and Herzegovina, Bay of Kotor, etc.). 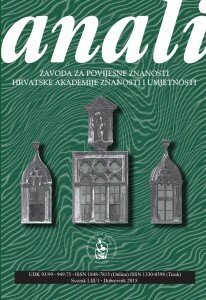 The Anali publish studies pertaining to various humanities and social sciences, as well as reviews of studies dedicated to the history of Dubrovnik, Croatia, Balkans and the Mediterranean. 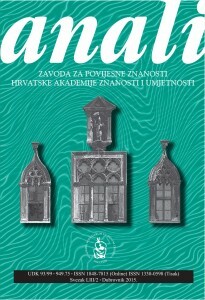 The Anali has appeared continuously since 1952, and, according to the classification of the Croatian ministry of science and education, it has the highest scientific rank (A1). All the issues since 1999 are available online for free (see the links below). This journal does not charge submission charges or article processing charges (APC), and therefore has no waiver policy. 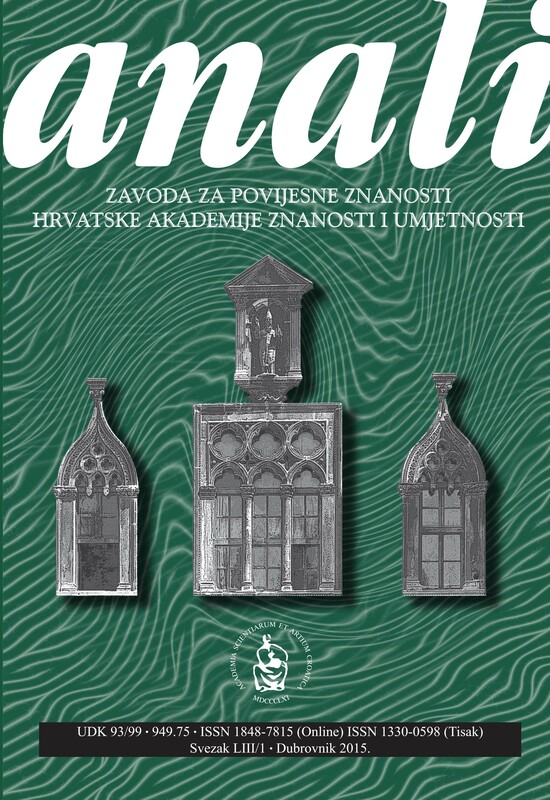 The journal is indexed, among others, in the following data bases: Scopus, ERIH PLUS, DOAJ, Hrčak. This journal employs the CC-BY-NC open access licence. The entire text of articles published in the journal may be freely used with due respect to the author’s rights. Scientific areas: humanities (history, archaeology, linguistics, philosophy, ethnology, anthropology, theology, history of art, and history of literature) and social sciences (historical aspects of economy, demography, pedagogy and law). 1 (1952), 2 (1953), 3 (1954), 4/5 (1956), 6/7 (1959), 8/9 (1962), 10/11 (1966), 12 (1970). 17 (1979), 18 (1980), 19/20 (1982), 21 (1983), 22/23 (1985), 24/25 (1987). 26 (1988), 27 (1989), 28 (1990). 29 (1991), 30 (1992), 31 (1993), 32 (1994), 33 (1995), 34 (1996), 35 (1997), 36 (1998), 37 (1999), 38 (2000), 39 (2001), 40 (2002), 41 (2003), 42 (2004), 43 (2005), 44 (2006), 45 (2007), 46 (2008), 47 (2009), 48 (2010), 49 (2011), 50 (2012), 51/1 i 51/2 (2013), 52/1 i 52/2 (2014), 53/1 i 53/2 (2015), 54/1 i 54/2 (2016), 55/1 i 55/2 (2017), 56/1 i 56/2 (2018).